The climate sensitivity due to CO2 is expressed as the temperature change in °C associated with a doubling of the concentration of carbon dioxide in Earth’s atmosphere. The equilibrium climate sensitivity (ECS) refers to the equilibrium change in global mean near-surface air temperature that would result from a sustained doubling of the atmospheric carbon dioxide concentration. The transient climate response (TCR) is defined as the average temperature response over a twenty-year period centered at CO2 doubling in a transient simulation with CO2 increasing at 1% per year. The transient response is lower than the equilibrium sensitivity, due to the “inertia” of ocean heat uptake. Scientists made numerous estimates of climate sensitivity over the last few decades and have yet to determine the correct value. 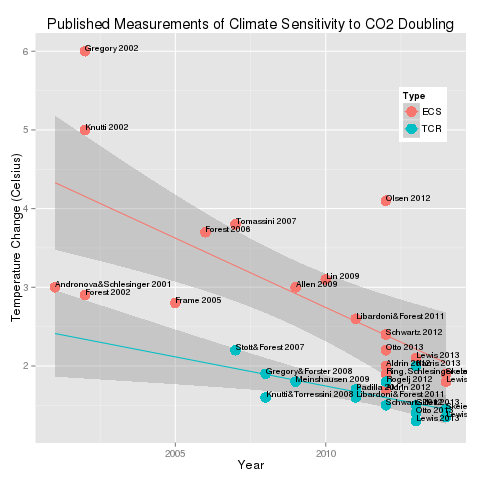 The figure shows the change in published climate sensitivity measurements over the past 15 years (from here). The ECS and TCR estimates have both declined in the last 15 years, with the ECS declining from 6C to less than 2C. While one cannot extrapolate from past results, it is likely that the true figure is below 2C, and may continue to decline. Based on this historic pattern we should reject the studies that falsely exaggerated the climate sensitivity in the past and remember that global warming is not the most serious issue facing the world today. Handy to show this in a single graphic. I presume it is possible to identify the various published studies? Could this be shown as well? Is it just my eyesight or does the confidence interval shrink to 2008-2011 and then slightly expand again? They are the prediction bands for the linear regression. They are smaller towards the centre of the data. Conceptually, as you get further away from the centre of mass of the data, one’s predictions become less certain. Please post a larger version of this very fine graph. I have just added a link to a pdf version. Will that work for you? One day, academia will arrive where PSI has been for years already: CS is zero or negative. CO2 is a radiatively active gas and how does earth lose heat to space? By radiation. It’s as simple as that. Does the coffee in your thermos heat up with a near-perfect insulation round it? Cooling is slowed down and that’s how insulation works. Having a radiating chemical as alleged “insulator” can only increase the cooling cycle, never decrease it. Oh, there you are. I tried emailing you recently, but apparently that email wasn’t valid anymore? Anyway, hi, and glad to see you’re still around and keeping people informed. The values behave essentially as a statistic in a sequential test. The sample size increases cumulatively with time. Even without random sampling the general features are that (1) the statistic approaches with time the true value, and (2) the variance of the statistic approaches zero. I would suggest to take here cumulative sample size n(t), treating each study as one observation, compute cumulatively the sum of sensitivity estimates, s(t), and finally the mean as s(t)/n(t). Difficult to obtain the values from the graph but for the red spots, I got as cumulative sample size, 1, 4, 5, 6, 7, 9, 10, 15, 19. In 2013 the mean has dropped to about 3. Note that on random sampling the variance of the mean equals the initial variance to be divided by n(t). By 2020 the estimates should be close to reality, by that time global cooling may be every evident. Do you have a version that includes the ranges for each estimate, not just the central value? Pingback: AAAS: “Let’s hold them accountable” | Watts Up With That?